Ah, the wisdom of Al Borland, Tim Taylor’s trusted sidekick on the 90s sitcom, Home Improvement. But, when it came to actually executing the project, Tim always messed something up. His handiwork was usually accompanied by a crash, explosion or perhaps some injury to Al or himself. Despite his best intentions, Tim Taylor was completely incapable. Honestly, I’m much the same way. I’m quite incapable. I am not just talking about with home repair, although, my mantra is, “a trip to Lowe’s is never complete without a second trip to Lowe’s.” I’m referring to my ineptitude and inability to be effective at most anything. This has been a chronic problem my whole life. There was a part of my life for a couple years where was completely unable to care for myself. Anytime I wanted to eat, I had to scream until food was brought to me. Often, I would even soil myself and have to writhe in it until someone would change me. My example being an infant may seem a bit of an extreme, but a good one when it comes to being incapable. As an infant, we are unable to care for ourselves. We can’t walk. We can’t talk. We can’t entertain ourselves. We can’t make decisions. We all had that experience in common. We had to rely on our parents to care for us. We require someone with capable hands to provide for us, nourish us, love us, hold us, clothe us, bathe us, change us and make sure we healthy and growing. It’s no different 3+ decades later, except that I can go to the bathroom by myself. I still need to have capable hands to guide me, help me make decisions, provide money and food for me, keep me healthy and love me. I require the capable hands of God. Over the last several posts, I’ve been highlighting my transition from a wonderful secular career to a career in ministry as a missions pastor. It’s by God’s provision that I had a successful career filled with friendships, accolades, nice bonuses and top-notch opportunities for growth and advancement. It is also by God’s provision that I was convicted by the Holy Spirit to desire a career change. As I responded and began seeking where God would have me go next, He brought forth an opportunity with our home church. I was baptized at that church as an adult. I was discipled by the leaders of that church. I was invested in by the community of that church. Soon, I was going to have the privilege of being on staff serving the people at that church and helping fulfill the Great Commission. #5: The call to a girl I was dating to let her know the Fraternity I was interested in offered me an invitation to join. #4: The (collect) call to my dad to let him know I scored my first point in a high school basketball road game. #3: The call to my parents after I proposed to my wife. #2: The call to my parents when we were expecting a baby. #1: The call to my wife to let her know we were moving back from Florida so I could become the missions pastor at our church. “It’s happening,” I said. The rest of the call was somewhat of a blur. I know I heard tears. I withheld mine until I was alone in my hotel room in North Carolina and then I unleashed my emotion in prayer on my knees. None of that would have been possible without the capable hands of Christ. It was because of his death that I had the opportunity to be saved. It was because of the conviction of the Holy Spirit that I was saved. It is by the Word of God that I continue to be sanctified. God is responsible for creating me, converting me and completing me. Without Him, I would have remained an unwashed sinner and someone who deserved death instead of eternal life. Over the last 32 years, God’s capable hands molded me. He stripped out insecurities, he removed some imperfections (there are still a lot left). He is making me into the purpose he intended. God’s capable hands provided others in my path; mentors, pastors, friends and a wife that aided in my discipleship. It is God who prepares us for our careers, equips us to handle situations and provides opportunities to excel. I was happy with my former career because God used it to build me up. He used it to provide for my family. Now, I am elated to be in a ministry position where my job is to share His love. It is a tall task, because Christ provided the example, one that I’ll never reach. Without Christ I was just incapable. Now, I’m in capable hands. The anticipation is back. The strategy consumes my thoughts. The competition starts churning in my veins. For a fleeting moment at the end of the fantasy football championship season, there are thoughts of relief that you don’t have to set another lineup for nearly nine months. Then you realize…that’s a long way away. That’s like…enough time to create a kid. The NFL draft in April is just a tease, but it’s nice to have talk of football again. The summer is a struggle. There’s no reason to watch SportsCenter from the end of the NBA season until the NFL preseason. But, fantasy football is back. And it feels good. Really good. Some people are a bit obsessive with fantasy football. These people make spreadsheets. These people talk about it to anyone who will listen about their upcoming drafts. These people are in multiple leagues. These people stress over their draft position and naming their team. I can’t just enter a league for fun. I have to win. I love strategy games. I’ve tried explaining to my wife that this is nearly 20 weeks (including draft prep) of nothing but strategy. When you win, it’s fantastic. It’s rewarding to triumph after five months of planning, risk, luck and over-thinking. When you lose, it’s crushing. It’s terrible to fall after five months of planning, risk, luck and over-thinking. You pick real NFL players to be on your “fantasy” team. You have a starting lineup and a bench. You largely draft only offensive positions like quarterback, running back, wide receiver and tight end. You also will draft a kicker and team defense. You get points for their performance. Many leagues award 6 points for a rushing or receiving touchdown and one point for every 10 rushing or receiving yards. For example, if Adrian Peterson runs for 100 yards and scores a touchdown you might score 16 points (based on your league’s scoring, of course). You can trade players with other teams and pick up players who aren’t currently on a roster, just like the general managers in the pros. I think most fantasy football players will agree that our favorite time of the year is the draft. There’s nothing like a live draft. All your buddies sitting in a room filled with unhealthy snacks for hours at a time while ribbing each other with each pick. For years, I’ve been in multiple leagues and have at least one that drafts in person. 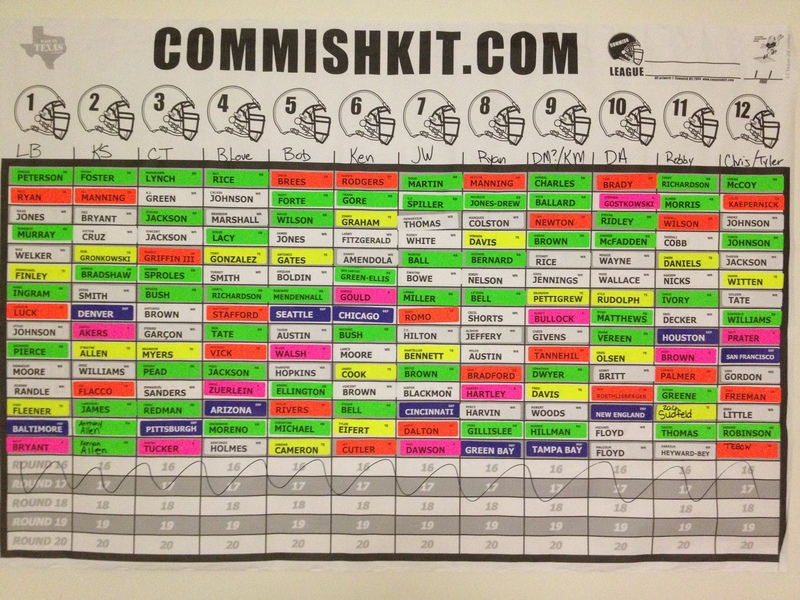 I usually buy a draft board, like the one pictured below. There are color-coded stickers by position with every player’s name on it. When it’s your turn, you grab the sticker of the player you want and put him on the big board. There are a number of considerations to make while preparing for the draft. How many people are going to be on my roster? How many bench spots? Is there a flex position? How does the scoring work? How deep is the league? I’ve also found that there are a number of considerations to make while preparing to serve as a follower of Christ each day. When is the last time I shared my faith with someone? Have I had my quiet time lately? Have I diligent in my prayer life? Over the next several sections, I’m going to attempt to draw parallels between preparing for a fantasy football draft and preparing for working for a real life Jesus every day. I’ve been in fantasy leagues for over 13 years now. I’ve been in leagues of many formats. There are salary cap or auction leagues where everyone gets a set amount of “salary cap” to spend on their players. It’s up to each manager to decide how they want to spend their money. Do they want a balanced team or a “stars and scrubs” team? There are keeper & dynasty leagues which allow each manager to keep a certain amount (either just a few or all) of their players from year to year. This is very similar to owning your own franchise. A few years ago, I drafted Aaron Rodgers very late in the draft. He sat on my bench for several years, just as he did in real life with the Green Bay Packers. But, then Brett Favre retired…kinda. The Pack gave the ball to Rodgers and he blossomed into arguably the league’s top QB. Luckily for me, he was on my team every year and helped me with back-to-back championships. Redraft are another option. Redraft leagues start over each year. Selecting players happens in a “snake” draft. This means that if you have the last pick in the first round, then you also have the first pick in the second round. Redraft leagues are a great equalizer and put a lot of emphasis on drafting a good team immediately, rather than building a good team over time. Just as it’s important to know what kind of league you are getting yourself in to, it’s important to know the type of team we’re playing for. As Christians, not only are we on a dynasty team, we’re on an eternal team. Everything we do has a forever impact. The team we’re playing for is not only the winning team, but it’s the team that has already won. God drafted us to his dynasty team when we placed our faith in his son, who died to forgive our sins. It’s nice to be wanted. My favorite kind of league are PPR scoring leagues. PPR stands for point-per-reception. PPR leagues add a different twist to standard scoring leagues awarding a point for every time a player catches the ball. PPR scoring makes certain running backs and wide receivers immensely more valuable than they might otherwise be. Wes Welker, now with the Broncos, is a great example of a standout PPR player. Welker spent the last several years catching balls from Tom Brady in New England, which made him valuable. But, it has not been uncommon for Welker to catch 7-10 balls in a game. For five out of the last six years, Welker had at least 111 receptions. His abundance of catches makes his value skyrocket. This scoring model really makes you think about each player you draft. From 2008-2012, Michael Turner has been a touchdown machine for the Atlanta Falcons, scoring at least 10 TDs each year. But, the most passes Turner caught during that time was 19, and that was just last year. As a result, there have been a number of other running backs drafted before Turner each year because of his futility scoring in a PPR format. This year, I’m in a scoring-only league for the first time. Simply, this means that yardage doesn’t matter. It’s down and dirty and only scoring matters. This is another huge twist in how I needed to prepare. Remember that remarkable season Calvin Johnson had last year? Megatron had 122 receptions, 1964 reception yards and 11 games with over 100 yards receiving (including 8 straight). He was a complete monster. But, 39 other players had more touchdowns than Johnson, including Scott Chandler, TY Hilton and Santana Moss. So, in this scoring-only league, none of Johnson’s yards and receptions would not have mattered. The points don’t matter. That’s right. Once I put my faith in Jesus, there is nothing else that I could do to earn my spot in heaven, gain his favor or change his mind about me. I could go to church every Sunday, have lots of Scripture memorized, put lots of money in the plate and help dozens of old ladies cross the street, but without belief in Christ and the willingness to follow him, nothing else matters. As of this writing, all drafts have happened and Week 1 of the 2013 NFL season is nearly in the books. The Eagles & Redskins are on TV and the new Philadelphia high-octane offense has run 19 plays in just about five minutes. The Redskins have had the ball for eight seconds. A few days ago, Peyton Manning threw for seven touchdowns. Some guy named Julius Thomas scored two touchdowns for the Broncos and Julian Edelman scored twice for the Patriots. Heck, the Jets won a game. These are things that you can’t predict. Some leagues do a random drawing just minutes before a draft to pick which draft spot you’ll have. I hate not knowing. Knowing in advance which spot you draft from is kind of like knowing the gender of your child. You get to pick out a name, pick the paint for the room and start looking at bedding (or toys). When I prepare for a draft, I do several mock drafts and take notes of the which players go in which round. I will chart each player I take by round based on different strategies. Do I start with two running backs? Do I take a tight end or quarterback early? Where do I want to grab my #1 wide receiver? I’ll add up all the projected points and then move forward with a strategy. But even my strategy has level of other strategy. I identify up to three players I want in each round for the first six or seven rounds. You could say I get in to it. I have realized over the last several years how “involved” I’ve been with fantasy football and I’ve stripped back a lot. (Yes, I used to be even more involved.) A few years ago, I was in up to six or eight leagues. Two of them were dynasty or keeper leagues with very active owners. I spent too much time analyzing trade scenarios, scouring the waiver wire and projecting starting lineups. I had to shift my priorities. I’m only three leagues that take up much less time. I’m trying to make sure that I have a quiet time each day and I’m striving for a strong prayer life. Rather than sorting through spreadsheets, I need to be involved in the lives of other Christians. Instead of studying stat lines, I should be memorizing scripture. I need to substitute conversations about lineups with conversations about Christ. See, if we’re going to be disciples and grow in our faith, we have to have a strategy. We have to be aware of who we are hanging out with (our roster), how we are going to be effective (our point potential) and even have a list of people we want to share our faith with (our waiver wire). Well, going in to the last couple games of Week 1, I’ve locked up a win in one of my three leagues and I’m desperately wanting Robert Griffin III to score me some big points (not looking good so far) in order for me to catch up in the other two. On paper, I have very good teams. On paper, my opponents might not. In reality, big things happened on the field this week and I’m down so far. I have no control over these players. I can’t prevent them from throwing interceptions. I can’t help them turn the corner and blow by the defense. I just have to sit back and watch and pray everything comes together. The only thing stopping me from reading more, praying more, sharing more and giving more is me. My fear of rejection, my selfishness, my comfort level and my ego get in the way. Unlike my fantasy teams, I have some level of control. I can determine who I speak to, what I read and what the condition of my heart is. I just have to commit, take action and pray everything comes together. 2001 was 12 years ago. What’s up with that? To put in perspective how this concept has blown my mind, here are some things that happened way back then. Baltimore Ravens won the SuperBowl 34-7 over the New York Giants. Ray Lewis was the MVP. In 2001, I was entering my junior year of college. I was enjoying waking up late and eating food from the cafeteria. That year, our lacrosse team was 4-7. That year, I broke up with someone for the first time. I like to refer to that day (October 3, but I’m not keeping track) as my Independence Day. So much has changed since 2001 both in our culture and in our lives. I was a happy student, surrounded by impressive grades and great friends. But, I was missing something and didn’t even know it. God was doing a work in me that I wouldn’t see for many years to come. During my junior year, I started taking the first of a couple semesters of poetry writing. I recently remembered the following poem illustrating where my thoughts were at the time. but I knew they were there. and a black umbrella to hide me from the rain. It’s very humbling to look back at this poem and see how God was filling my thoughts and convicting me about how I was missing him. It would be another couple years before I would make a decision to commit my life to following Christ, but the Holy Spirit was already working on me. Poetry has always helped me understand myself. The subconscious creeps in and lingers. The loneliness, abandonment and disappointment I was feeling when I wrote the poem is completely different now. God has accepted me. Christ has redeemed me. The Holy Spirit guides me. The emptiness I felt has been replaced with hope. The desperation I felt has been replaced with joy and satisfaction. The shame I felt has been replaced with love. I thought I was completely unworthy, but Christ showed me my value.